Do you ever go on vacation, only to realize you have forgotten something? It is the worst feeling knowing that you leave something you know you are going to need for your trip at home. There are so many things that you need to remember that packing can be very overwhelming. This is why we always make a packing list for each person in our family. When it comes to packing for a Disney Vacation, it is even more important to make sure you have what you need. 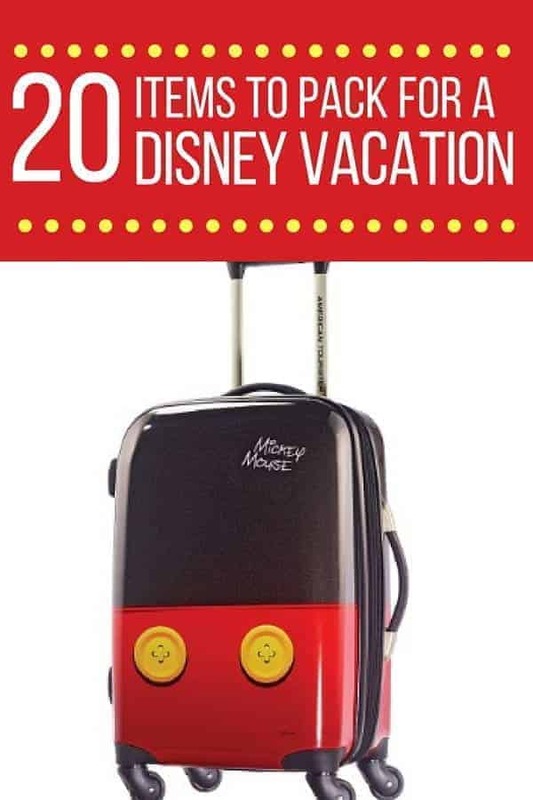 Our Disney World packing list ensures that we have not only our vacation essentials, but the things we typically use while we are in the Disney parks. If you are planning a Disney World vacation this year, we encourage you to create a Disney World packing list that not only includes the clothes & toiletries that you need, but also the theme park essentials! 1. Sunscreen. If you are flying, you are going to find that bringing a full size suntan lotion difficult because of TSA regulations. There are two ways to get around this: purchase travel size sunscreen, a sunscreen stick, or purchase a regular size sunscreen on Amazon and have it shipped to your resort. 2. Poncho. The weather in Florida can be unpredictable. Do yourself a favor and pack lightweight ponchos for everyone in your group. 3. Power Strip for the room. Disney has gotten better about providing USB ports & outlets in their renovated rooms, but not all rooms have enough outlets. If you need to charge multiple devices, you will be so glad you have a powerstrip. 4. Anti-Chafe Stick to help for heels of feet and inside of legs. You may not think you need to add this to your Disney World packing list, but I swear that this is one of those things that is essential. These sticks can be lifesavers for your feet and your thighs. 5. Hat/ Visor/ Sunglasses. It is sunny in Florida all year long. Do not go to Disney without something to shield your eyes and face from the sun! 6. Swimsuit/ Water wings/ Goggles. If you are planning on swimming while you are on your Disney vacation, you will want to make sure that you have the things you need. While towels are provided, you don’t want to be without the other swimming essentials. 7. Nightlight. This is one of those things that everyone forgets to pack for Disney World. Rooms can be dark and if you want to find the bathroom in the middle of the night, a portable nightlight that you can leave in the bathroom certainly helps! 8. Sound Machine (in case your room is situated next to someone who is loud). This is one of those things that we take everywhere we travel. No one wants to miss out on sleep because of noisy neighbors! 9. Ziploc Bags. I can’t tell you how many times we’ve used these for various reasons. They are great to pack wet clothes (for a variety of reasons), hold snacks, or just to be used to protect electronics when it rains! 10. Portable Charger for cell phone. You will be so glad you have this with you! 11. Lanyards/ Autograph Books While you can buy these at the parks, I think you will find it far cheaper to buy ahead of your Disney Vacation. 12. Good pair of walking shoes (these are my favorite shoes for Disney) & flip flops. Two things you will need when it comes to your feet are walking shoes and a pair of flip flops if you are planning to go to the pool. 13. Small Soft Cooler. If you want to carry cold water or snacks like applesauce or yogurt with you into the park, these small soft coolers are essential. 14. Costumes. If your children want to dress up at the park, don’t forget their costumes. You are going to pay at least twice as much for a costume in the Disney parks. 15. Wet wipes and/or Hand Sanitizer. While Disney has plenty of bathrooms to wash up, it isn’t always convenient. Bring along some hand sanitizer or wetwipe packets to keep those germs at bay. 16. Backpack. Pack an easy to carry traveling bag to take into park. We prefer these backpacks because they are lightweight & have tons of pockets for storage. Check out what I put in my day bag. 17. Bandaids. More specifically we not only pack regular bandaids but also Waterproof Blister bandaids (just in case). 18. Stain Remove Pen. If you plan to do laundry on vacation, be sure to pack some travel detergent (pods are great) otherwise bring a Tide Stain Pen so that you can treat a stain in a flash. 19. Laundry Bag. Have you given thought to wear you are going to put your dirty clothes? Packing a laundry bag will give you a place for the entire family to dump their clothes at the end of the day! 20. MagicBands/Park Tickets. If there is one thing you don’t want to forget to pack, it is your Disney MagicBands or park tickets! Are you worried about packing too many things in your suitcase? Did you know that you can ship items to your Disney resort from Amazon? If you have an Amazon Prime membership, you can ship items you buy online directly to your Disney Resort. If you want to mail a package ahead of your vacation, be sure package includes the mailing address of your Disney Resort Hotel and has your name with the word “Guest” beside it. Also include your arrival date. Do you make a Disney World packing list? What items do you include? Great list! I always forget an extra set of batteries. I would maybe add another SD card for your camera–I take a lot of video on my DSLR so I fill my cards up a little quicker. Over from The SITS Girls! No tickets needed if staying at a Disney Resort!! Magic Bands… Awesome hands/ticket free invention! Yes, you can use MagicBands if you are staying at the resort or are an annual pass holder. The rest of the public will still use paper tickets. We always pack Disney window clings to put on our hotel window!! Makes it easier to spot our room, plus it just makes it fun!! That’s a great idea. . . . . just thinking. . . . we’ll be celebrating our granddaughters birthday while we’re there. . . . might try to find some birthday window clings. . . . . where can I find some window clings by the way? Look at Dollar Store. They have tons of Disney items! I am not sure if they have window clings, but they do have Disney Magnets. powerstrip! If you have lots of electronics (phones/iPads) you run out of outlets quick. Also some thing new we took on our most recent trip was a portable battery charger that had USB ports so when our phone batteries started to get low (using it for the my disney experience app and as our camera) we could charge our phones while walking around the park. You are so right! They put the outlets in the oddest of places and there are never enough! Power strip for the room is genius! Great list! Thanks. That Power Strip is truly a life saver! Love your list, I always seem to forget my power strip, I need to keep one in my “adventure” bag. Since I am semi local I never know if I am going to stay overnight or not, so my adventure bag is kept in my car for unexpected adventures. I can’t live without my umbrella and mister fan, especially during the summer heat. I got a umbrella from Target that blocks UV rays, it is amazing! Thanks so much for linking up at the Magical Monday Blog hop! That Mister Fan is a must for summer months at the parks!